Fall is a time for harvest, for feasting and gathering, for celebrating the yield of our collective work. It is also a time to prepare for the winter, to look ahead to the future. Our sukkah is many things: a space for gathering and celebration, a storehouse, a toolshed. We intend to repurpose a 10x8 standard ISO shipping container that is a ubiquitous form that can be found at any port, especially Detroit. Given Detroit’s history with maritime trade and the over abundance of containers that are available, coupled with a container's utilitarian durability, we chose this for its simple but effective shelter from the weather as well as its robust structure. The roof s’chach will be planted with native vegetation that are also sustainable and edible that represent the potential for urban farming in Detroit. Wrapping the container is a rain screen of wood boards painted with varying patterns. Vertical poles radiate outward from the structure as a series of “anamorphic” glyphs. These topo – typographical objects are designed so that from particular angles they would appear as abstract objects and from others they reveal the readable text. 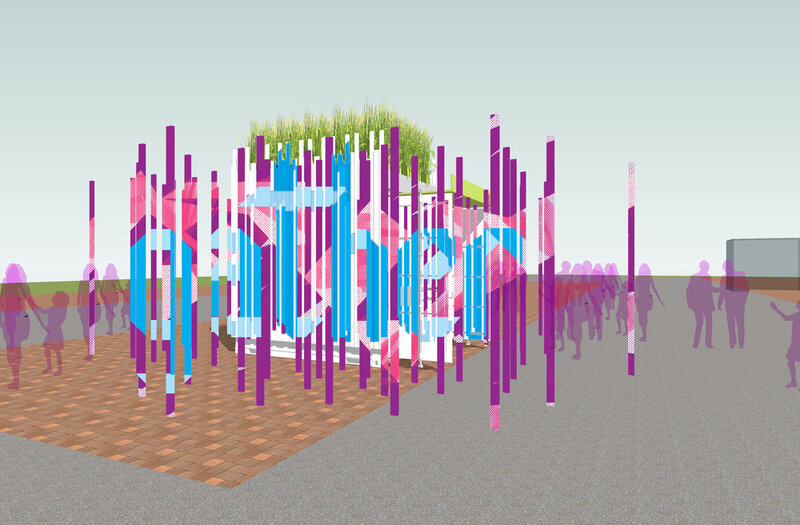 The clarity of the sukkah comes from two different vantage points where the painted facade and the vertical poles align to read the words "gather" and "harvest," leading viewers to the entrance of the sukkah. 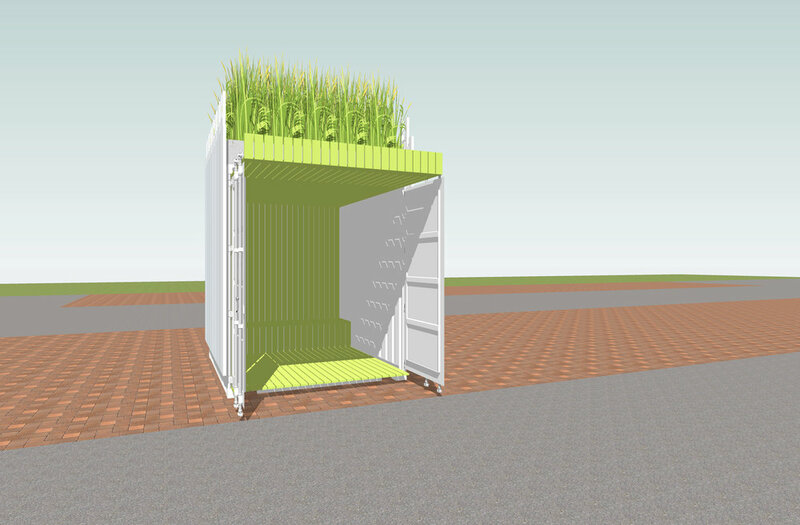 Following the exhibition, we intend to provide the sukkah to an urban garden / community agriculture partner so that they may utilize the structure beyond the event, providing a functional space for many harvests to come.